“I no understand this decision,” England Coach Fabio Capello complained moments after his team’s elimination from the 2010 World Cup, after losing to rival Germany. “The mistake of the linesman, and I have to say also the referee, is inexplicable because from the bench I saw the ball in the net.” He was right, as you can see for yourself: referees had failed to spot a clear goal by England’s Frank Lampard in a knockout game against Germany. World Cup 2010, England vs. Germany: Manuel Neuer of Germany watches the ball bounce over the line from a Frank Lampard shot that hit the crossbar, but referee Jorge Larrionda judged the ball did not cross the line. Four years later, FIFA had a solution to prevent egregious mistakes like this: Goal-line technology was used for the first time at the World Cup, combining multiple high-speed cameras with specialized computer algorithms that could quickly detect the ball’s location, and send an alert to the referee’s watch when the ball crosses the line. The technology was a success, and so FIFA looked to see how they could take the technology further. With $6.1 billion dollars on the line for a successful 2018 World Cup, a little investment must have seemed appropriate. Video assistant referee (VAR) technology is designed to support, not replace, the decision-making process of referees. Used only in four game-changing situations, goals, penalties, red cards, and cases of mistaken identity, where the wrong player is penalized, VAR provides minimum interference with maximum benefit. The video assistant referee isn’t designed to make decisions, the system’s purpose is to support and inform the actual head referee in the decision-making process, and the final decision can only be taken by the referee. According to a study conducted on the trials, VAR increased the accuracy of refereeing decisions from 93% to 98.8%, which is significant when you consider that almost half of the world population is expected to watch the World Cup this year. Football fans will be informed about the review process via broadcasters, commentators and video delivery platforms. The technology will be used in all 64 matches, with a system in every stadium, video footage from all available broadcast cameras – and two dedicated cameras – fed to a special referee team located in a centralised video operation room in Moscow. 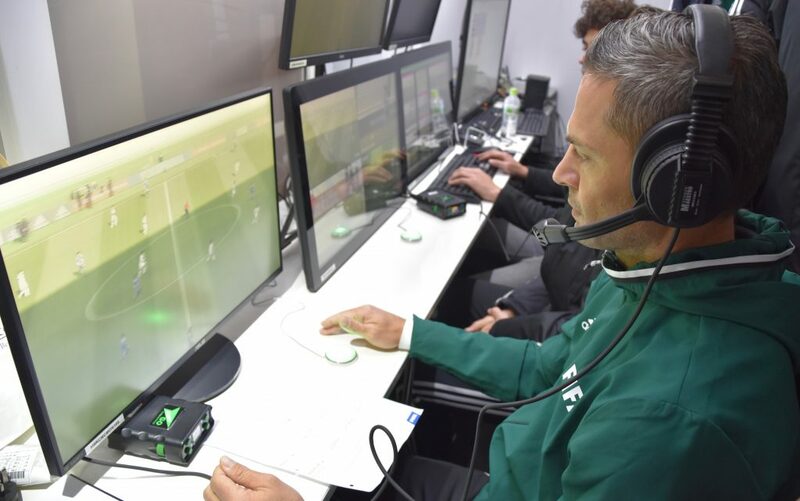 For each game, the room will contain a team that consists of a lead video assistant referee and his three assistant video assistant referees, all of whom are top FIFA match officials, selected by the FIFA Referee Committee and trained on this system. A supporting team of replay operators quickly select and finalize the right camera angles that the video referees choose to be shared with the referees on the pitch. If the team discovers an error, the VAR would then contact the referee on the field via an earpiece, advising him either of an error, or that they should check a decision themselves. The video assistant referee team will have access to the feeds from 33 different cameras. Most of these cameras will belong to the FIFA host broadcaster. These cameras will be used to aid subjective judgments, for example, the intensity of an offence or to determine if a handball was deliberate. Two of these cameras are specifically for offsides calls and are only available to the video assistant referee team. These are based on Trimble SPS620 DR Robotic Total Stations, electronic distance measurement tools that can precisely measure hard-to-reach or unsafe places up to 2 kilometers (1.2 miles) away. They are calibrated to detect players crossing the moving ‘offsides’ line in three-dimensional space, as no part of the player is allowed to cross. In addition, eight of these cameras will be super slow-motion cameras. They are typically half or one-third speed, offering a compromise between additional motion information without causing significant delays to actually review. Slow motion replays are more often used for factual situations, like identifying the point of contact of a physical offense or the position of an offense. 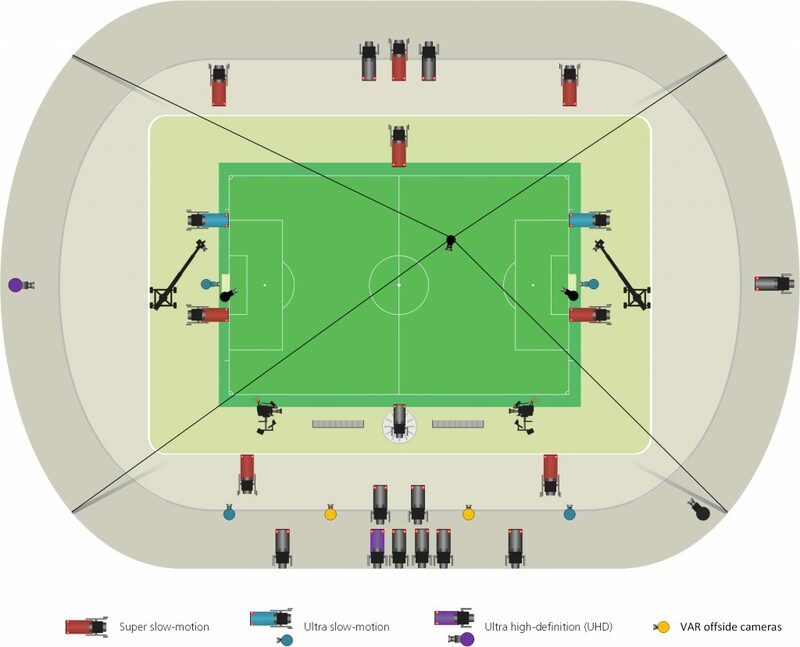 Interestingly, four more cameras will be deployed in “ultra-slow-motion.” FIFA doesn’t specify their exact speed, but the “ultra” typically denotes a 12x slowdown, meaning a three-second event would take more than half a minute to review! These are the kinds of cameras that people use to record darts and bullets. To get a sense of Ultra Slow Motion Footage, this is pretty good. This may sound extreme, but at the world-class level, a game-deciding shot can be travelling at 80 miles per hour, with the goal keeper needing to make crucial decisions in a matter of milliseconds. These ultra-speed cameras are quite different from normal broadcast cameras, with very different sensors and signal processing. They require much more light and typically make big compromises in terms of picture quality – it’s unlikely that we’ll be seeing this footage during matches. While considering super slow-motion cameras can be placed anywhere to cover the action (and provide a simultaneous single-speed output, ultra-slow-motion cameras are typically placed where you know a specific event is going to happen – like between two goal posts. For the knockout phase, two additional ultra-slow-motion cameras will be installed, one behind each goal for the VAR team. 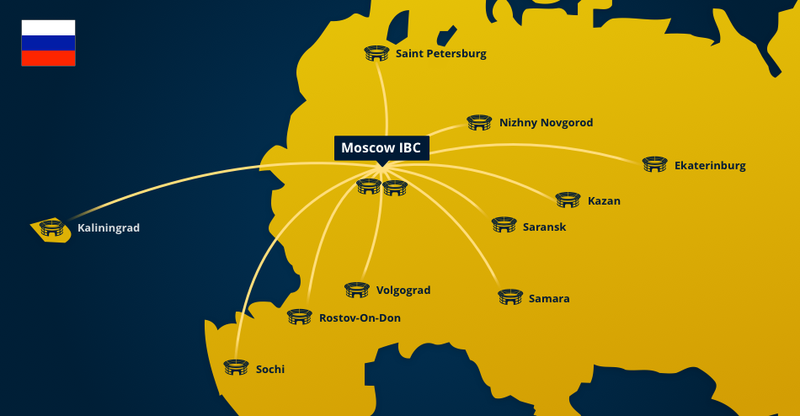 Making sure the technology at the 2018 FIFA World Cup Russia™ functions seamlessly is a complex task that requires a lot of planning, coordination and organisation. And it may not go perfectly. Some argue that VAR causes too many interruptions, disrupting the flow of the game. But disruptions already take place as angry players crowd around a referee following a controversial decision. VAR should help to eliminate such scenes and get the game moving again once the indisputable decision has been made with the aid of technology. And the fact is, the referee will continue to make the majority of decisions on the field of play, turning to VAR only occasionally during a game. How will we know it’s happening? They’ve invented a new signal for referees to show when VAR is in action. Watch for it!